I (Susanne) thought about the biblical meaning of the number four. These four arrows represent the world system that puts those under pressure who eagerly want to follow the Lord. The two people with arrows coming at them from all directions seems to portray what we have been going through for some time with many attacks from the enemy causing afflictions in our bodies and our hearts. This sign depicts what it is like when two walk together in the unity of the Spirit and how the adversary presses in on them from every side. As we looked at the picture of the sign we noticed that these two are not alone, there is a third Person behind them as if He is looking over them with His arms around them. We are being pressed in from every side, but the enemy is actually pressing us into Christ! In the above verse Paul actually said, “we have the answer of death.” Death of our old self-natures is the answer to our prayers that we be conformed into the image of God’s Son. As I (Michael) thought about what this sign depicts, many scriptures came flooding into my mind. Here are a few of them. When we experience adversity and are afflicted with bodily pains, our adversary does all he can to get our eyes off Christ who has not left us, and onto our pains and attacks. But in all this we have the promise that our Teacher, the Holy Spirit, will continue to teach us in and through all these things. He teaches us and fine-tunes us to hear His gentle whisper and follow His leading in the most adverse circumstances. Even after we have passed through the valley of the shadow of death, we are not free of our enemies. Rather, God prepares us a banquet table of spiritual food in the midst of them and their attacks. It is here that we experience the anointing of the Holy Spirit on us and the goodness and mercy of the Lord in spite of what our enemy attempts to do. We start to dwell in the house of the Lord and His covering in all situations. Yes, it seems like a very lonely walk in which we are made a prey of our enemy. As the sign shows, he comes at us from all sides in his attempt to overthrow our faith. We can’t expect any help from men and the world around us. The Lord alone will uphold us and vindicate us because He is with us. Even in the midst of verbal attacks by others, we find that we can take shelter in Christ in heaven and He foils the evil plots against us. It is here that we discover the abundance of our Father’s goodness towards us. Yes, we can take refuge in the shadow of His wings! As Jesus said, “How often I would have gathered you together unto me as a hen gathers her chicks under her wings…” God lets adversity come upon us so that we will cry out to Him and fulfill His purposes in us. He shows His great love and faithfulness to us through it all. Who shall separate us from the love of Christ? Shall tribulation, or distress, or persecution, or famine, or nakedness, or danger, or sword? As it is written, “For your sake we are being killed all the day long; we are regarded as sheep to be slaughtered.” No, in all these things we are more than conquerors (Grk. HuperNikao – to totally conquer or totally overcome) through him who loved us. (Rom 8:35-37, ESV2011 – emphasis added). This is the ONE unto whom our eyes are. Faith is thus exercised and enables us in the very midst of pressure and contradictory circumstances to rise upward and stand in Christ Jesus in the position He has given us, “seated together with Him in the heavenlies.” “Ye are made full in Him in Whom dwelleth all the fulness of the Godhead in bodily form.” – Col. 2:9. Wow! Did you get that? God has chosen us in Christ from before the foundation of the world. In His love, He foreordained us in our adoption as His sons and daughters into Himself (the Greek is clear that we are chosen in Christ and that as we have believed into Him and it is here that we have all the grace and love and faith we need – see 1 Cor. 3:22-23). It is all a matter of the faith of Christ working in us. The enemy does all he can to get us to doubt and live as if we are subject to this world instead of seeing that we abide in heavenly places in Christ Jesus, which is our inheritance now in Him. We are overcomers because we are in Him who has overcome the world. Everything that the enemy does to us only presses us further into our Lord and Savior, Jesus Christ. Most of us who read this blog have given our lives to the Lord. Once we started living this new life in Christ we became new spiritual creatures. We set out to find spiritual food, like a new born babe looks for its mother’s breast making sucking movements with its little mouth. My wife, Dorothy, and I have had four children and she breast fed each of them. There is nothing more sacred or peaceful than watching a baby nurse from its mother’s breast. According to this passage, whose breast should we be nursing on right from the beginning as spiritual infants? “If you have tasted… the Lord…coming unto the Living Stone…chosen of God…” JESUS is the Word that we should be getting our nourishment and spiritual immunity from right from the beginning, not the breasts of men! But how many of us who have been born again were put on His breast right from the beginning? How many were taught to seek our spiritual sustenance from Sunday sermons and Sunday School classes in the churches we attended? Most of us were taught nothing about the Comforter Jesus sent in His place who would lead us into all truth (see John 16:13-15 also 1 John 2:26-27). Then shall the kingdom of heaven be likened unto ten virgins, who took their lamps, and went forth to meet the bridegroom. And five of them were wise, and five were foolish. They that were foolish took their lamps, and took no oil with them: But the wise took oil in their vessels with their lamps. While the bridegroom tarried, they all slumbered and slept. And at midnight there was a cry made, Behold, the bridegroom comes; go out to meet him. Then all those virgins arose, and trimmed their lamps. And the foolish said unto the wise, Give us of your oil; for our lamps are gone out. But the wise answered, saying, Not so; lest there be not enough for us and you: but go you rather to them that sell, and buy for yourselves. It is interesting that all ten of them were virgins and all were waiting for their Bridegroom to come. Yet the fate of half of them was not good. Their lamps had gone out while they slept and the Bridegroom was delayed. Why? They had been in the habit of getting their oil from other virgins, piecemeal… just enough get by. But the wise virgins knew where the real source of their oil was to be found, Him that has the supply! The later in this dispensation of grace it gets, the more important it is that we have a good supply of oil if we are going to make it through these times of trouble that are upon us. In the Daily Study Bible they comment about this parable. It warns us that there are certain things which cannot be borrowed. 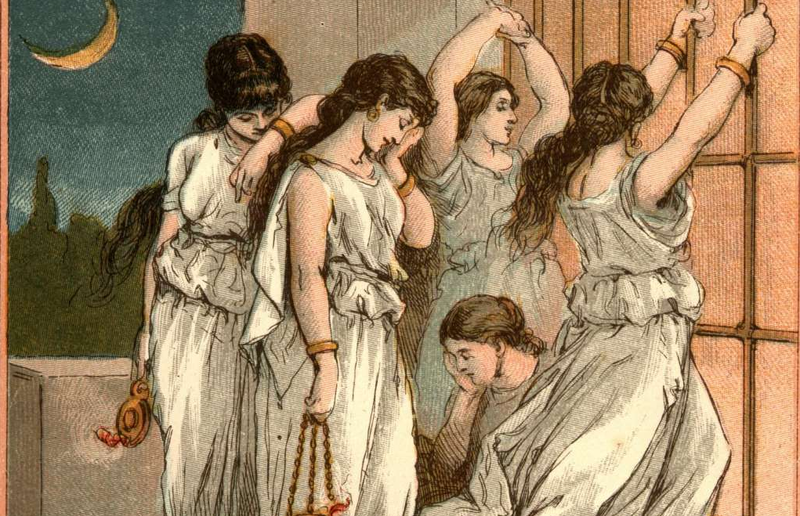 The foolish virgins found it impossible to borrow oil, when they discovered they needed it. A man cannot borrow a relationship with God; he must possess it for himself. A man cannot borrow a character; he must be clothed with it. We cannot always be living on the spiritual capital which others have amassed. There are certain things we must win or acquire for ourselves, for we cannot borrow them from others. To the foolish virgins the Lord said, “Verily I say unto you, I know you not.” But wait! They were all virgins, were they not? And is it possible for the all-knowing God to not know one of us? This verse is speaking of a lack of intimacy with Christ as our Bridegroom. Jesus knows who have been feeding from His breasts and who have not – who have been taught by His Holy Spirit and who have been nursing from the breasts of teachers and preachers who have no unction. Jeremiah prophesied this very problem that Israel was also guilty of. So, dear virgins who are called to be His bride, where do you get your oil? Whose breasts are you drinking from? How good is your spiritual immunity? It is crucial that you find out where your Source of spiritual food is! Have you ever heard of the death of a vision? God gives us a taste of what He has for us to walk in, even does the work of that vision through us for a brief season, and then takes it away. You see this pattern in Moses setting out to deliver the Hebrew people from the hands of the Egyptian slavery one task master at a time, only to learn that God had something far greater in mind. With the Hebrews he was trying to help turning on him, he high-tailed it for the back side of the wilderness in fear of Pharaoh. There he tended his father-in-law’s sheep for 40 years. So much for that vision—at least that was what Moses thought until he had an encounter with God 40 years later! Then there was Joseph and his dreams of greatness as a young man. His dreams did not please his folks or his brothers when he told them that they would all bow down before him one day. The brothers did their best to make sure that this dreamer never ruled over them, and plotted to kill him! You know the rest. He was sold into slavery in Egypt, and thrown into prison for a crime he didn’t commit. Insult and injury seem to be his lot for being faithful to God. Twenty-three years after the brothers sold him into slavery, the dream was fulfilled. A lot of dying has to take place for God to get a purified vessel He can use effectively after He calls him or her. My case was similar. About 1978 He started to move by His Spirit in me through words of knowledge, prophecy, dreams and such. We had a group of people meeting with us in our home as well. It was a heady time for me. I finally had something from God that my own father never provided for me – a sense of identity. Like Moses, I did not know the difference between my soul and what was of the Spirit, and pride started rising up in me. Because of the accuracy of things He gave me and the resulting pride, I was dangerous. He showed me the mixture, and I started praying that He would purify me. One day I heard Him say, “Michael, if I quit moving in your meetings with my Spirit, will you try to fake it?” I replied, “No, Lord, if you quit, I quit.” After that that He pulled the plug on everything I identified as spiritual in my life. About this time, I had what I felt was prophetic dream of a dear 35 year old friend of ours who had abdominal cancer. Sandy was prophetic and we shared a lot of things back and forth. In this dream I could see my hand reaching down to her where she was lying on her sick bed and I was praying that she would be healed. I was so startled I woke up abruptly, woke my wife and told her about the dream. I then went back to sleep and dreamed the second half. You know how we have those wonderful, feel good dreams and want to go back to sleep and have it some more and it never happens? Well, not in this case! In the second half of the dream her family and mine were all sitting around a large dining room table with the sunlight streaming through the windows. Sandy was now looking like a 24 year old woman in her prime, and she was talking about her healing from the Lord. This startled me awake again and this time I stayed up. The next day I made an appointment to see the pastor about my dream. He told me to just sit on it and wait and see if God would confirm it. I waited and waited, and Sandy got sicker and sicker. Finally, for a brief time her cancer went into remission enough that she could come to church one Sunday. It was the first time in six months and when I saw here sitting there it was like an electric shock went through me! I got a chance to ask the pastor during the service if it was time to pray for her. At the end of the service, he had me come up and tell my dream, then invited Sandy and the church elders to pray for her healing. We had given Sandy and her husband a large Chrysler station wagon. A few months earlier, the Lord had told me that the car was going to die when it turned over 103,000 miles. It had a six-way driver’s seat, so Sandy could adjust it to be more comfortable while hauling her kids from place to place. One day about a month after we all prayed for her, Sandy passed out, drove into a tree, and slid forward into the steering wheel. From that time on, her cancer went full speed and it wasn’t long before she died. I was heart sick, and felt like the worst false prophet that ever walked. Fourteen years went by from the time I prayed for Sandy in front of the congregation before I could feel the presence of the Lord again. Everything stopped. A sense of His presence was gone, the Bible quit speaking to me, and my prayers hit the floor with a thud. I had no meaningful fellowship with other Christians. He also stripped me of the pride of the work of my hands with long periods of unemployment. I was thoroughly dead by the time He finally showed up again in a way that I could recognize as Him. As I started to feel His presence once again, He spoke to me while sitting in a church service and said, “You have not been this way before.” These were the same words God spoke to the Children of Israel as they were about to cross over the Jordon at the end of their 40 year wilderness. He also reminded me that a seed that falls into the ground and dies doesn’t look like what springs up as a sprout. The idolaters that left Egypt 40 years earlier were not the ones that God took across the Jordon into the Promised Land. About this same time, my wife and I started going to a home fellowship again. A lady named Kathy had been battling cancer in her abdomen (Yup! Re-runs). After what I went through 14 years earlier, I would never have volunteered to pray for her healing. I figured that God didn’t want me to do that any more. Because she was weak, the leader of the group decided to take the meeting to Kathy’s house so she could be there. That evening her husband carried her down the stairs from the bedroom and put her in a recliner in the corner of the living room. At one point during the meeting, the leader’s wife said to me, “Michael, I want you to stand in front of me and hold out your hand without touching me and pray for me.” I said, “Alice, I feel like a nickel waiting for change. I think you ought to be praying for me.” But she insisted, so I did what she asked. Next thing I knew, Alice fell to the floor, thump! So Kathy said, “Michael, will you pray for me, too? My cancer is flaring up again and the doctors aren’t giving me much hope.” I thought, “Oh boy! Here we go again — more dying!” Her husband scooted her off the chair onto the floor so we could all get around her and pray. I held my hand above her torso about six inches and started praying quietly as the others joined in. All of a sudden I felt a strong magnetic buzzing in my hand, and as I swept it back and forth from her chest to her abdomen, the buzz got stronger over one spot. She had her eyes closed and said that it was like having an MRI–she could feel everywhere my hand moved. I started hearing the word “pancreas,” so I asked her if the doctors had told her that she had pancreatic cancer. She said that they had. We decided to keep praying until that feeling left my hand. About 45 minutes later the buzzing stopped. At that point Kathy sat right up and said, “Okay, that is healed! Now pray for my kidneys. They said one of my kidneys is dead.” So I went around behind her, and without touching her again, moved my hand back and forth from the left side to the right. The buzzing in my hand started over the right kidney, and she confirmed that was the one. We prayed for about thirty minutes. Finally the magnetic buzzing quit. Kathy jumped up and said, “Okay, I’m healed.” Off to the kitchen she went to make us all a snack tray! Mind you just two hours earlier she had to be carried into the front room. The next day she went to the gym and worked out. God wanted me to know that He still loved me could heal my broken heart as well. I know that some of you have gone through similar circumstances, and I hope this has encouraged you. There has to be a death in us before the power of His resurrection Life can be manifest in and through us. Since God raised me up from my spiritual death in1994, He has used me in many diverse ways but told me not to put a label on what I am in Christ as so many people do, claiming a particular calling and title. The flesh loves titles! Most of what I do is write what I hear the Spirit saying here in our little home in the back woods of Idaho, then share it with the body of Christ over the Internet. I keep as low a profile as I can. It is no longer about me! I pray often that Paul’s words would be true, “For me to live is Christ and to die is gain.” And, “I can do all things through Christ who is my strength.” Amen. Oh, that car that Sandy drove into the tree? They had the auto body class at the local technical college fix it up. One night it caught fire and burned, and that was the end of it. Yup, the odometer read 103,000 miles. I often sit at my keyboard waiting for the unction to write something from the Lord on our blog. Each time He makes me wait and as time drags on I wonder if He is through with me. This morning I read two quotes back to back, one on the blog of a dear sister in Germany (http://enteringthepromisedland.wordpress.com/2014/11/07/on-receiving-more-of-the-holy-spirit/) and the other a quote from T. Austin-Sparks from a sister in New Zealand in my daily devotional, “Open Windows.” http://www.austin-sparks.net/english/openwindows/003437.html. I hope you don’t mind me quoting from them here. (How much is our own reputation worth? Are we willing to give it over to God for Him to deal with? For most Christians I have met, that is a bit too much. Most want to at least salvage that much from their own lives and they fight to save it “so they can be more useful for the Lord.” But even that has to go if we are to be yielded totally to God. Remember, even Jesus made Himself of no reputation when He came down to earth in the form of a lowly servant). As we yield to God are we then “controlled” by the Holy Spirit? Demons possess people and take control, but the Spirit of the Lord leads. 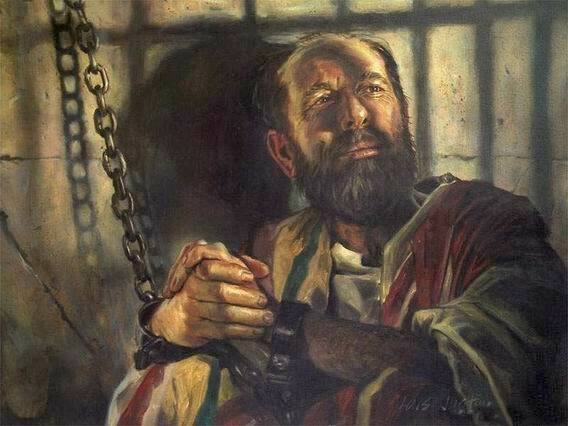 Paul wrote, “I Paul, the prisoner of the Jesus Christ…” To be yielded to the Holy Spirit is being controlled like prisoners are controlled, the guards open and close doors in their cell block from remote that either allows or denies them access to other areas (See Acts 16:6-9). They still have a modicum of freedom, but it is orchestrated freedom. Jesus said to Peter, “Verily, verily, I say unto you, When you were young, you dressed yourself, and walked where you would: but when you shall be old, you shall stretch forth your hands, and another shall dress you, and carry you where you would not.”(John 21:18 KJ2000). The more we pursue the Lord and the anointing of His Spirit, the less freedom we have to do things the way we used to, yet the more unction we experience as we yield to the will of our Father and part of that is the continuous working of the cross of Christ in our lives. It takes us from being “when you were young” and self-willed into “when you shall be old,” becoming yielded vessels of the Spirit. God bless each of you as you seek His will to be done in your lives and my fellow bloggers as you write.